You are invited to attend a meeting of the Sons of the American Revolution (SAR) and Sons of Union Veterans of the Civil War (SUVCW) on Saturday, 20 April 2019, at 11:00 AM at the Round Table Pizza on Leslie Road in Richland. It will be a Civil War presentation on the GAR (Grand Army of the Republic), Women of the GAR and the Women’s Relief Corps. Come early due to limited seating. There will be a book sale—Civil War books. 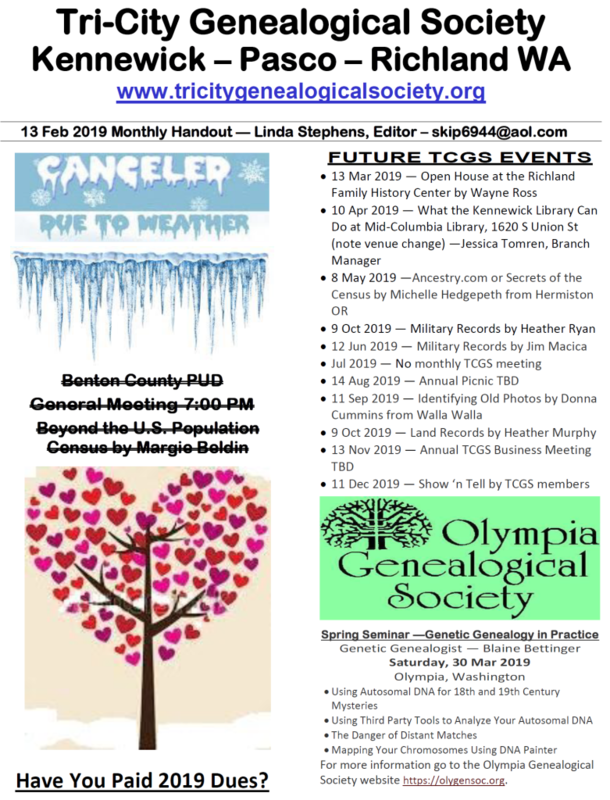 After having to cancel last month’s TCGS meeting due to the weather, the forecast for this Wednesday’s March meeting calls for sunshine all day! Please come for a special open house tour of the Richland Family History Center. 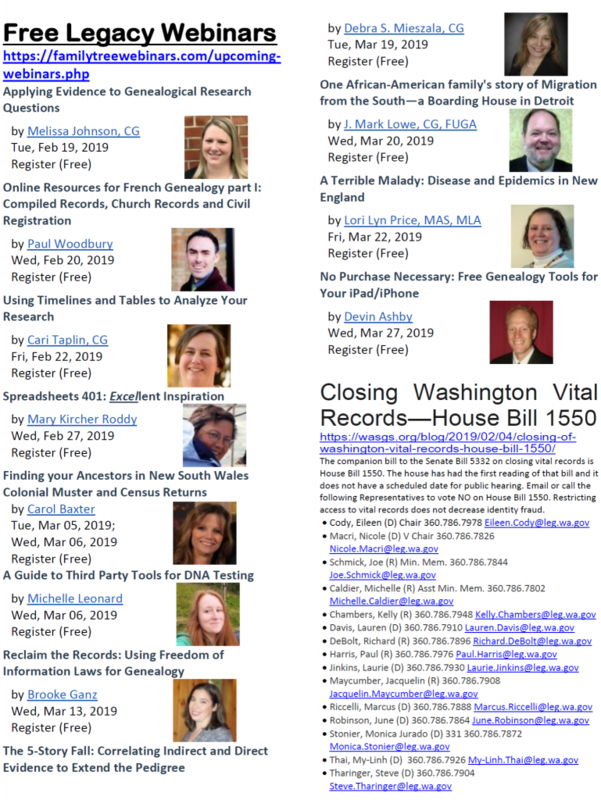 Legacy Family Tree Webinars (https://familytreewebinars.com/ ) is offering a huge collection of webinars in 2019. See the attached webinar schedule. Registration & watching the webinar live is free. Typically the webinars are free for 7 days. Other options for watching are a yearly subscription for $50, a monthly subscription for $10 or purchase a digital download for $10. The program for this year will be the Show & Tell event and we will not have a Beginning Genealogy Class that evening. The program activity starts at 7:00 p.m., but for those of you who are setting up displays, you can come as early as 6:15 p.m.
Members and guests are asked to bring items about your family heritage/history as well as what interests you have. Your legacy will one day be handed down to your children/grandchildren/great-grandchildren and they will want to know what hobbies and collections you had as a child/teenager or as an adult. You can display your family photographs and documents on a poster or a tri-fold or on the table. This will be a fun event for everyone to have a glimpse of your family history as well as the antiques/heirlooms, hobbies and collections that you either inherited or have or previously engaged in. Please bring homemade or store bought cookies, candies, fudge, muffins, quick breads (banana, zucchini, apple, pumpkin), cake, etc. Beverages, plates, napkins and utensils will be provided. The program for this year will be the Show & Tell event and we will not have a Beginning Genealogy Class that evening. This activity starts at 7:00 p.m., but for those of you who are setting up displays, please come as early as 6:15 p.m.
Members and guests are asked to bring items about your family heritage/history as well as what you interests you have. Please be advised that the Richland Family History Center now has a 130 volume set of “The War of the Rebellion Official Record of the Union and Confederate Armies”. This set of books is in the basement of the Richland Family History Center and will only be there for a limited time. So, please take the opportunity to research these books as soon as you can. Monday, Friday, Saturday: 9:00 a.m. to 5:00 p.m.
Tuesday, Wednesday, Thursday: 9:00 a.m. to 9:00 p.m.
at the P.U.D. Auditorium in Kennewick. We will be covering what makes people migrate and what are the consequences of those migrations depending on whether it was a push or pull factor – in other words, did they choose to leave or were they forced. And when forced, how the political and geographical circumstances affected their lives. Hopefully, you will be able to attend in spite of the schedule change. Please invite someone to attend the class and the program. Please be advised that the TCGS October meeting will be on the 17th which is a Wednesday. We will not meet on the 10th which is the 2nd Wednesday due to PUD schedule changes. Hopefully, you can still come to the meeting on the 17th. The Beginning Genealogy Class and the Main Program will be at the same designated times. 1. 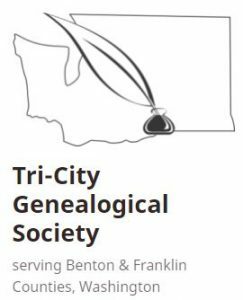 Beginning Genealogy Class: 6:15 p.m. to 6:45 p.m.
Margie Beldin to give a talk on Roots Web and the WayBack Machine. that are available free at any Family History Center. I hope you will make plans to attend another informative class/program meeting.